Artists are now using the iPad as a creative tool. Some of those creations are unbelievable. I love the watercolor effect on this app. 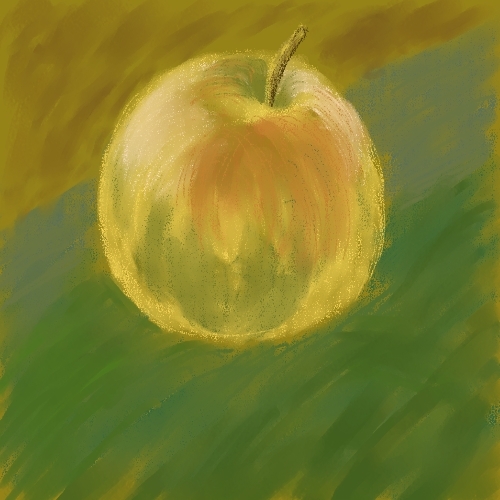 Another app I love is called "ArtRage". It has a beautiful textured paper which makes pencil work look very realistic. Anyone else using the iPad to create art? Hmmmmmm, I may have to try these. Thanks for sharing!! It's going to be hard to hang your iPad on the refrigerator, though. Wow, this is fun. I've already bought all the brushes and other options. Thank you! 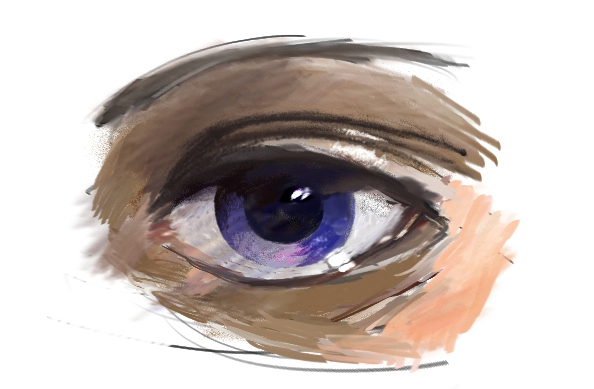 I use ArtRage also. It is a great program and a lot of fun to play with. I have seen some impressive paintings completed by others using ArtRrage. Unfortunately my ArtRage work probably does not qualify as art but I enjoy creating it. I am no "artist" either. But like you I'm having fun with it. Another app with great reviews is "Procreate". I haven't tried this one. Wow, that's good! what tutorial did you use? I hope this isn't an utterly dumb question, but can't you print the art you make with your iPad? Also, for another form of art using iPads and I think also iPhones, check out this youtube clip. I think someone posted it here last year. You can indeed print the art you make on the iPad. I was basically a stick figure drawer before reading Drawing on the Right Side of the Brain and learning to sketch. I found that doing it on an art pad with a stylus was a lot of fun without having to buy supplies. Thank you for the link. That may start me off on a new tangent. While I have the technical skills pretty much nailed on photography I struggle with the artistic side. Once in a while I get it but that the exception, not the rule. Pretty much every book I've read about photography mentions the artistic side of it but they don't address the issue head on. Perhaps this book does. It has been a long time since I read it (and practiced the techniques) so I can't remember how much it addresses artistic vision. I suspect you may have gotten as much in photography books. What it does well is teach you techniques needed to draw what you see. It breaks it down to small strokes and takes you through exercises that help you realize that you can do "this." But "this" is drawing lines that fairly accurately represent what you are looking at. For a stick figure guy who always wished he could draw, that was more than good enough but art is an entirely different thing. Still, you may learn some things about shadow and contrast that improve your eye for photography. Karen's Sperling's tutorials for using Painter were a different thing - both more interesting and less simple. For example, with the eye, I was learned that you could achieve shadow and contrast with colors in ways that are not intuitive. Unfortunately, in the brief amount of attention I brought to the enterprise all I could achieve was a step by step replication of what she explained in terms of brush strokes, blending, color choices, etc. It was a "wow" experience to see it come out but didn't leave me capable of replicating it on my own without the step by step instructions -- that would have taken a lot more practice and effort than my ADD addled personality could muster. I did get pretty good at rendering flatter, less complicated stuff on my own in Painter but that level of skill is not all that rewarding which may be why I dropped the hobby. I took one art class at the local JC that really helped. It was on color theory. Beyond that there is no substitute for just doing art *a lot*. Fill up some sketch books. After maybe 100 oil paints outdoors (plein air) I can get a decent painting with decent value relationships and color that I like. That's in addition to the many paintings I've done in the studio -- most of them thrown away (hint: don't keep your ugly stuff around). Maybe the electronic gizmos are a good idea for some purposes. Anything that gets you to draw a lot is a good idea. Good paintings are generally built on the ability to draw well. Of course, these are just my biases as art is extremely subjective. DW and I have good discussions about this all the time as she is a long time artist (sells her work). I do have to say though that most art is intermittently connected to the media. For example, doing watercolor one should use very good pigments and consider the effect of the paper weight and type. Watercolor technique does not really translate to oils although maybe a bit to acrylics. I wonder how doing an electronic watercolor would translate to the subtlety of traditional watercolor. BTW, if you are just starting out I'd not make the mistake of thinking watercolor is a good starting media. It's tough and unforgiving. Unforgiving because you cannot go over it easily like you can in oils or acrylics. Apologies if I have strayed OT. I'm a bit of an art nut. Watercolor technique does not really translate to oils although maybe a bit to acrylics. I wonder how doing an electronic watercolor would translate to the subtlety of traditional watercolor. Ha, ha. 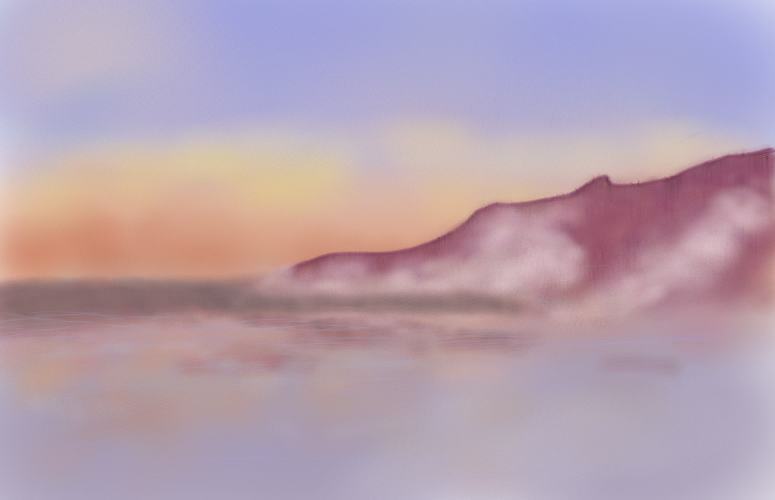 The first steps of my attempt at a misty seaside with Painter's watercolor brushes. Ruined even further when I tried to add in some foreground sand and rock which I will kindly forgo posting. People who get into it can do nice watercolors with electronic media.